There is a long list of heads of state and members of royalty assassinated by anarchists in the last half of the 19th century and first years of the 20th century. The list includes Czar Alexander I (1881), French President Carnot (1894), Empress Elizabeth of Austria (1898), US president McKinley (1901) and King Umberto I of Italy (1900). Failed attempts were also many and included two against the life of Napoleon III (1855 and 1858) and two earlier attempts against Umberto I (1878 and 1897). The first of the two failed attempts against Umberto is the subject of this entry. The episode involving the would-be assassin, Giovanni Passanante (also spelled in some sources as Passannante), took place in Naples and is of extreme interest mainly because of how the young united Italian state reacted to an, admittedly, foul deed. The attempt on Umberto's life is straight-forward. On November 22, 1878, the royal family is on a visit to Naples and is proceeding by open carriage through a throng of, one imagines, mostly well-wishers. 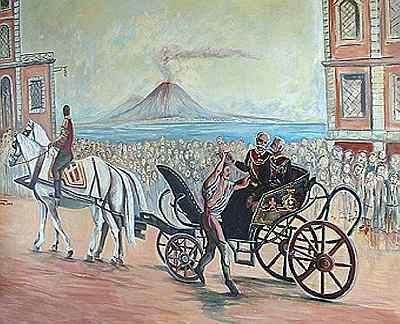 The king and his consort, Queen Margherita, are accompanied in the coach by Italian prime minister, Benedetto Cairoli. At a certain point, 28-year-old Giovanni Passanante, from Salvia (near Potenza) and a cook by profession, springs onto the step of the carriage and lunges at the king with a knife. The assailant has withdrawn the knife from a scarf on which is later found to be inscribed "Death to the king! Long live the universal republic," and as he attacks he is heard to shout "Long live Orsini!" (the assailant in the 1858 attack on Napoleon III). The king is wounded slightly in the arm and the attacker is restrained by Cairoli and then knocked to the ground by a sword stroke from a guard on horseback. The entire affair lasts a few seconds and, as attempted murders go, winds up as relatively minor affair —except for the aftermath. The next day in Florence an anarchist bomb goes off in a crowd that has gathered to celebrate the survival of Umberto; four persons are killed, including a young girl. About a dozen others are injured. The newspapers scream of the "anarchist plot." Failed assassin, Passanante, is tortured (!) into a confession of such a plot, although it later becomes clear that a plot does not exist and that he has confessed only to make the pain stop. A few weeks later, the Cairoli government collapses. The right-wing in the government demands limitations on freedom of the press and more control over what should be taught in Italian schools. The left responds in the words of Minister of Education, Francesco De Sanctis, who says eloquently: "When reaction comes calling, it doesn't announce itself by saying, 'I am reaction.' It says, 'We need true freedom, but to do this we must reconstitute the moral order'." A fiery, young poet, Giovanni Pascoli, then writes an ode to Passanante containing the lines, "We shall make a flag of the cook's cap!" Pascoli goes to jail for that but is eventually released, a far better fate then what happens to Passanante and, indeed, to his entire family. Passanante was held mentally competent to stand trial for the attempted murder of the king. The trial was in Naples in March, 1879, and had its moments of high-flying lawyerese: The prisoner's counsel, one Leopoldo Tarantini, declared that his client was the victim of a corrupt state of society, that his mind was unsettled by the unlimited freedom of speech (!) that had reached its climax in the Cairoli administration, and that if his client was given the opportunity to recognize his error he would be the first to cry "Viva il Re!". That brought applause from those in the courtroom, but did not affect the verdict. Death. Wait! said some nimble legal mind —the death penalty can be applied only if the king actually dies from an assault. Thus, for better or worse, Passanante's life was spared and he was sentenced to life in prison. And it was worse than death. He was held for three years in an underground dungeon at Portoferraio on the isle of Elba. The quarters were too small for him to stand, and there was no light or toilet; he was held in absolute solitary confinement with weighted chains on his legs. Even his guards were under orders not to speak to him when they brought food. He lived in his own excrement for three years and simply went insane. Appeals by some journalists and members of parliament, aghast at the barbaric treatment, got Passanante moved to an asylum for the criminally insane, where he lived the rest of his life. He died in 1910. An ultimate insult was the decapitation of his corpse so that the head might be sent to the institute of Cesare Lombroso where his disciples (Lombroso died in 1909) would try to examine the skull and brain in order to find the place where anarchy resides. (Let's just say that criminology has come a long way since 1910.) Passanante's head would not be reunited with the rest of his remains until 2007, when they were all interred in his home town. Passanante's family —his 76-year-old mother, two brothers and three sisters— guilty of being related to a would-be regicide, were not only expelled from their home in Salvia, but they were imprisoned in the Aversa asylum for the criminally insane. One brother managed to escape. The others died in the asylum. Passanante's home town of Salvia is not on any map of Italy. You have to look for Savoia di Lucania. In is near Potenza in the Basilicata region Italy, a few hours inland and south of Naples on the modern autostrada that passes nearby. Within days of the attempted assassination of the king by one of their townspeople, the Salvia city council petitioned to change the name of the town to Savoia in honor of the dynastic name of the king ('Savoy,' in English); thus, they sought to expunge the shame brought upon the community by Passanante. There is currently a small struggle in the town between those who want to change the name back to Salvia and those who want retain the name Savoia. I cannot account for the discrepancy in the most commonly cited Italian versions of the fate of Passanante's family and a report on a visit by king Umberto to the area of Passanante's hometown shortly after the attempt on his life. A report from the New York Times cites an English source as saying that the king inquired if any members of Passanante's family still lived in "Salvia" [although the name of the town would have been changed by then]. When told that, yes, the aged mother still lived there and was not well-off, the king arranged to have 500 lire delivered to her "at her home." My gut rates that NYT report at about 2 on a 1-10 scale of plausibility. It seems to me that Ye Olde Royal Press Corps was cranking out fodder for the international press in order to hype the image of the Re Buono —the Good King. (Umberto's detractors continued to refer to him as the Re Buono a nulla—the Good-for-Nothing King.) In any event, Umberto stayed out of the political fracas that followed in the wake of the attempt on his life; when asked directly about it, he simply joked that "you have to be careful of cooks." There is no debate about the treatment of Passanante. He was, quite bluntly, tortured to death. The Neapolitan historian and philosopher, Benedetto Croce, said that even in the most brutal Bourbon prisons of the Kingdom of Naples before the unification of Italy, prisoners were allowed to read. That remark was cited from a reprinted letter-to-the editor in The Daily News (London) about the general mistreatment of political prisoners in Italy. The writer says, further, that "Authority, society, government may have the right to take the life of a murderer. This is not a question to be discussed here; it is absolutely certain that government, society, and authority have no right to reduce even a murderer by torment to insanity or idiocy." —Fruttero, Carlo and M. Gramelli. (2010). La Patria, Bene o Male, Mondadori, Milan, pp.47-48. —Petacco, Arrigo. (1974). L'anarchico che venne dall'America, Mondadori, Milan, p.124. Solitary Confinement in an Italian Prison Has Direful Results. Life-Termers Prefer Death to Spending Five Years in Cellular Segregation. There is a special madhouse for criminals at Montelupo near Florence, and the majority of its inmates are convicts sentenced to life imprisonment. Recently, the institution was visited by a party of medical students who furnish details about the condition of the two regicides Accianto and Passanante who are both insane. Whenever a secret of the criminal madhouse is made public, Italians realise the cruelty of cellular segregation and a reform is invoked in parliament. Deputy Di Nicola has now taken the matter up and is striving to bring about the abolishment of cellular segregation which he qualifies as being even more even more hateful than the pain of death.